Justin Geduld has recovered from the injury, which cut short his participation in the Emirates Airline Dubai Sevens, while Springbok Sevens coach Neil Powell believes the improvement shown by his 13-man squad in the latter stages of last weekend’s tournament was enough to keep faith in the same players for the HSBC Cape Town Sevens. ● Powell also congratulated team physiotherapist, Hugh Everson, who will be running repairs for the Blitzboks in his 100th tournament. · Kyle Brown (67th) will move one tournament closer to the all-time Blitzboks mark of 68 HSBC World Rugby Sevens Series tournaments achieved by Frankie Horne. 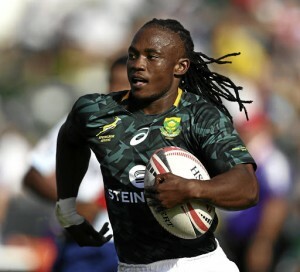 · Branco du Preez (1175) is second on the Blitzboks all-time points’ scoring list. Cecil Afrika (1430) heads that list.